Baader's T-2 Spacer Ring Set gives you a way to adjust/set the rotational position of T-2 threaded components. Have a lock screw that faces in an inconvenient position? Slip one of the thin delrin spacer rings over the T-threads and the rotation angle is modified (changes the point at which the threads seat). Utilizing an individual ring in-between any T-threaded components also prevents the possibility of frozen threads due to temperature change or over-tightening. 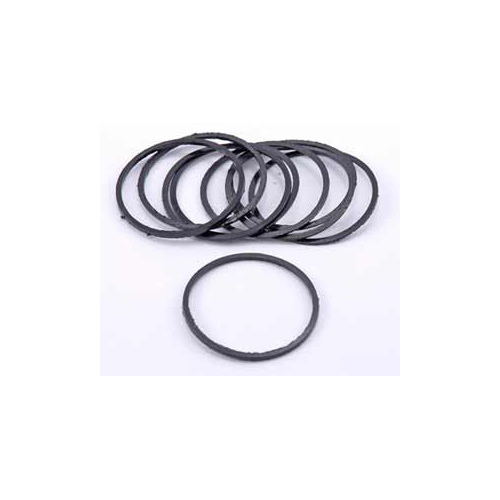 The T-2 Spacer Ring Set comes with three each of 5 thicknesses of rings to give a range of adjustment (0.6/0.8/1.0/1.2/1.4mm). The rings are supposed to be a somewhat tight fit and must be pressed down over male T threads with your fingers with a bit of pressure. Inside diameter = 41.3mm, outside diameter = 45.9mm. 4.2 (Based on 17 Reviews) 76% of reviewers recommended this product. These spaces allow you to tune in the back focus that optimizes your camera, filter and guider configuration. Nice variety of spacer options. Although each spacer is threaded, I prefer to split then (like a piston ring) to allow easier application and removal. My back focus is now spot on. These rings are precisely moulded to match T2 threads. You will need to push them into the threads. To remove you will need to pry them out using precision slotted screw driver. They give are useful to get correct spacing for your adapters, rings and tubes. The adapter rings arrived very quickly, haven't had a chance to use them yet, but they should be fine. This is a nice assortment for fine tuning back focus or lining up components on the light path. I believe the thinnest rings are about 0.6mm. It would be nice to have a few thinner rings as well, but the ones supplied cover a wide range. I most definitely recommend clipping the rings before trying to use them. This does not affect their function and makes them much easier to apply and remove. I received an email highly encouraging me to review these spacers. They are wonderful and circular! I find the circumference equal to two times pi and the radius. Lot's of complaints elsewhere on the rings almost impossible to seat on a T2 thread. It is possible but tough. These are delrin and hold there shape perfectly, so simply cut the ring and save yourself the effort.100% recommended. I use the Rings for two things. Ordination: I have a ST-80 with three 25mm T-2 spacers screwed into the focuser's draw tube and the guide camera screwed into the other end. The rings between the camera and the male threads of the extension tube allows a secure fit wile properly aligning the camera to the axis of the mount. I had to use three as spacers to allow this and prevent any flexure of the draw tube. Equipment functionality: I have a .7" filter wheel which adapters and spacers interfere with the filters. The treads go to deep into the filter wheel. Placing these rings between the spacers allow the filter wheel to work, while giving a secure connection between the two parts. Review by JoeR of Columbus, OH. The so-called "spacers" are not threaded and impossible to use. I've been trying for a long time to get an OAG to focus a guide camera and it cannot be done with spacers. Too long or too short. I thought this would be the solution but it was not there is no way to make them compatible with anything. I used these to allow me to set the rotational position of my T-2 Quick Changer on my Baader T2 prism diagonal. (I wanted the quick changer clamp to be positioned at the 6 o'clock position.) The spacer rings are not easy to get on. I ended up making a cut on one side of the ring with a scissor which then allowed me to slip it onto the diagonal's threads easily. Excellent product that is very usefull in getting spacing just right. Getting them over T threads was almost impossible even after I heated them so I ended up cutting them. Took one star off for that, otherwise great product. Review by Jeff of Houston, Texas. Great for tuning spacing for focal reducers, field flatteners and coma correctors. Even though the rings need to be cut to fit over my T threads, it really is not a problem and makes the ring easier to remove. Review by JD of TN. A very handy item, so simple and easy to use you forget it is there. Review by stevel of Escondido. It is a little hard to put on, but it does fit. Once on it gives me the little extra back focus that I need. Review by The Mad One of Central Indiana. Could not slip a one of them over the male T-ring threads to use a spacer on any of the several t-ring threaded accessories I own. The I.D. was cut too small on the batch I got.... useless 2 me. Review by SteveC of Monroe, NC. Allows very small adjustments to position of Nikon T2 mount. Great when using Afocal.